Import a multibody model into the Simscape Multibody environment. Use the smimport function for this task. You can import CAD, URDF, and Robotics System Toolbox models. 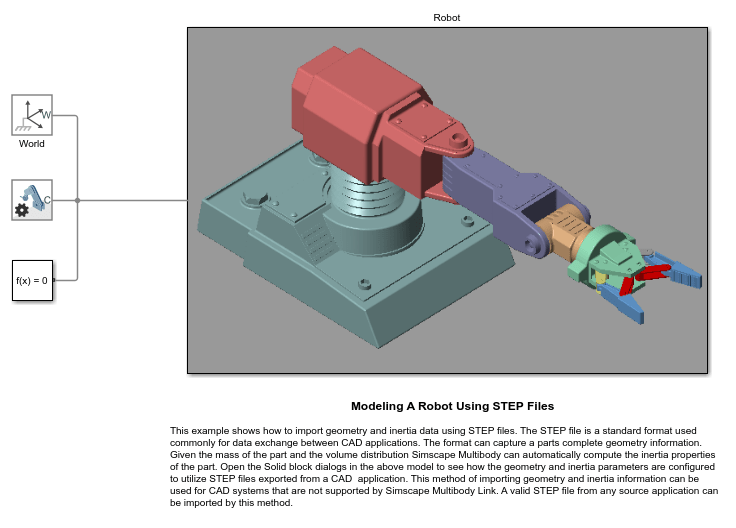 Robotics System Toolbox models require a product license to create. The function parses the model, extracts the necessary data, and reconstructs the assembly using Simscape Multibody blocks for its bodies, constraints, and joints. URDF models must be in URDF files and Robotics System Toolbox models in rigidBodyTree objects. CAD models must be in a suitable XML format. Use the smexportonshape function to export them as such from Onshape software. Use the Simscape Multibody Link CAD plug-in for Autodesk® Inventor®, Creo™ Parametric, or SolidWorks® models. The plug-in is free to use. See the Simscape Multibody XML schema for an example of a custom export app for models from other sources. 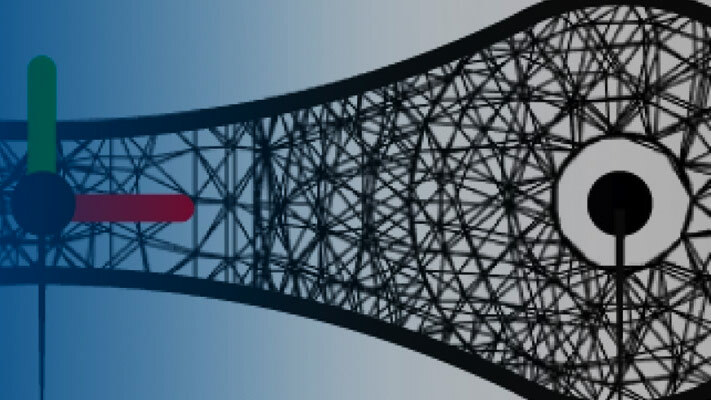 Overview of CAD translation with emphasis on workflow, tools, and generated models. General steps for generating Simscape Multibody models from XML multibody description files. Use the smimport function to generate a robotic arm model from a multibody description XML file. Overview of CAD import from Onshape® software with emphasis on import workflow, tools, and user authentication. Export a humanoid robot from Onshape software and import it into Simscape Multibody software. Learn about the URDF specification popular in the robotics community and create a simple URDF model for later import into the Simscape Multibody environment. Importing a URDF model. Mapping URDF entities to Simscape Multibody blocks. A simple URDF import example. This model illustrates the CAD import workflow in Simscape™ Multibody™. 1. Export CAD model into a Simscape Multibody Import XML (stewart_platform.xml). 2. Import the Simscape Multibody Import XML into a Simscape Multibody model using the smimport command. 3. Enclose the imported model into a subsystem (Stewart Platform). Interface layer is created to isolate the imported model from the blocks used to interface it to the rest of the model. The subsystem "Stewart Platform/Imported Stewart Platform" contains only the imported model. 4. Export input (Force) and output (pos and vel) ports that correspond to the control inputs and sensor outputs. These form the interface of the Stewart Platform model to its controller. 5. Within the subsystem, connect the force input and sensor output ports to appropriate blocks of the Stewart Platform model. Example: see block "Stewart Platform/Imported Stewart Platform/ActuatorAssm1_2/Cylindrical". 6. Connect the controller to the Stewart Platform model inputs and outputs. 7. Design the controller gains using control design tools. 8. 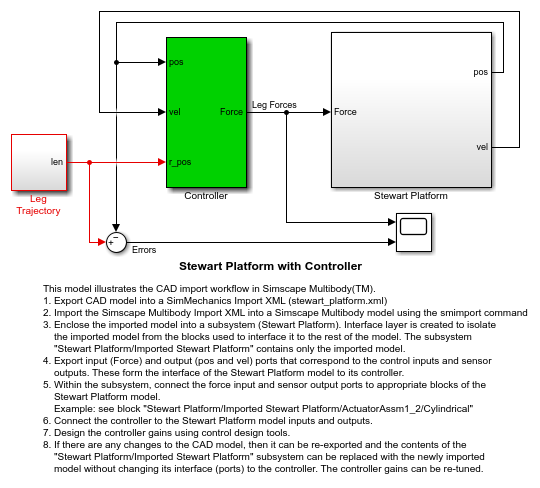 If there are any changes to the CAD model, then it can be re-exported and the contents of the Stewart Platform/Imported Stewart Platform" subsystem can be replaced with the newly imported model without changing its interface (ports) to the controller. The controller gains can be re-tuned. Has been imported from a CAD assembly designed in SolidWorks® using the smimport command. The XML file "fourbar.xml" and the STL files obtained during export of the CAD assembly have been used to create this example. Import geometry and inertia data using STEP files. The STEP file is a standard format used commonly for data exchange between CAD applications. The format can capture a parts complete geometry information. Given the mass of the part and the volume distribution, Simscape™ Multibody™ can automatically compute the inertia properties of the part. Open the Solid block dialogs in the above model to see how the geometry and inertia parameters are configured to utilize STEP files exported from another application (CAD for example). This method of importing geometry and inertia information can be used for CAD systems that are not supported by Simscape Multibody Link. A valid STEP file from any source application can be imported by this method. Has been imported from a URDF file using the smimport command. 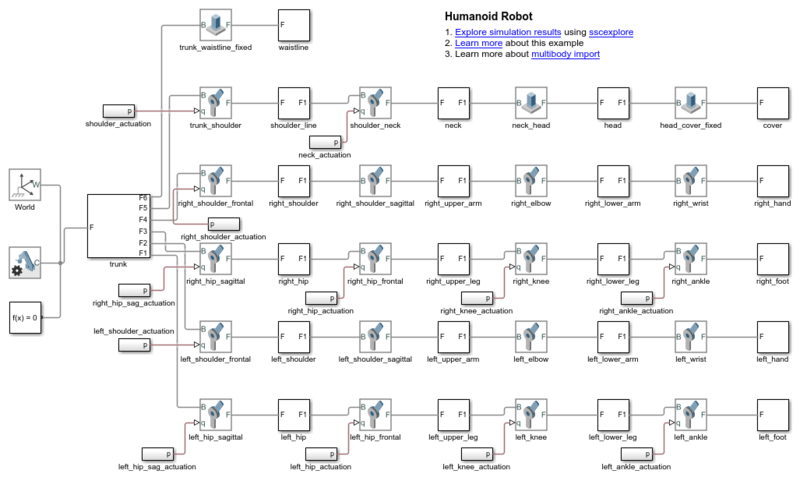 The URDF file "sm_humanoid.urdf" and the STEP files that visualize the robot parts were used to create this example. Motion actuation of the joints was manually added to the imported model to make the robot perform interesting movements.